Moving to an assisted living facility can be a time of emotional upheaval for seniors. Not only are they leaving behind a home of their own, they need to learn how to live in harmony with strangers. Settling into a seniors home can increase anxiety and leave many new residents feeling out of place and worried. 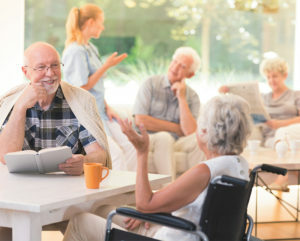 If you’re moving a loved one into an assisted living facility, below are five tips you can share to help them overcome their anxiety in their new surroundings. 1) Learning to sing on a daily basis can significantly reduce tension and anxiety. Seniors who make a habit of singing songs from their childhood or teenage years can reduce their feelings of discomfort and feel more at home. Encourage your loved one to sing in their room even if they don’t have a great voice or can’t carry a tune. We have introduced this in our home with our child on the autism spectrum and he LOVES it. It’s not unusual for him to belt out anything from Amazing Grace to Scooby Doo! Singing is a fun coping method to help remedy anxiety for any age. It really works! 2) It might sound simple, but helping your family member to laugh and smile more can ease their transition into senior living. Share jokes, help them practice silly smiles, and make a point of reducing tension with gadgets that prompt laughter. Search an e-commerce site like Amazon.com for ‘noise machine’ and you’ll be amazed at the goofy sound machines you can purchase for your family member. Better yet, hang pictures up in their room of family and past events that make them smile..
3) Seniors who take part in their new community tend to feel less stressed than those who hole up in their room. Just because your loved one is living in an assisted living facility doesn’t mean they can’t make new friends. Encourage them to take field trips with other residents or participate in community games and devotion. Participation in our scheduled events will help to reduce their level of anxiety at their new surroundings. 4) Old hobbies can be especially comforting to those who have recently moved into a seniors home. Remind your loved one of hobbies they used to like and encourage them to start enjoying those hobbies again. Anything from knitting and crocheting to model building and puzzles can be enjoyed while living in their new home. They might even discover other residents who have an affinity for the same relaxing hobbies. 5) If your loved one is experiencing mild depression and anxiety, encourage them to speak with their family physician. Changes is behavior could mean their medication needs checking or they need to start taking an herbal supplement like 5HTP to prevent mood swings. Speaking with a medical professional can put your mind at ease and help your loved one adjust to their new home. Share these five ways to overcome anxiety with your family member and there’s a good chance you’ll both feel better. Living with anxiety doesn’t have to be a permanent state of mind if your loved one is willing to make small adjustments in their daily routine.